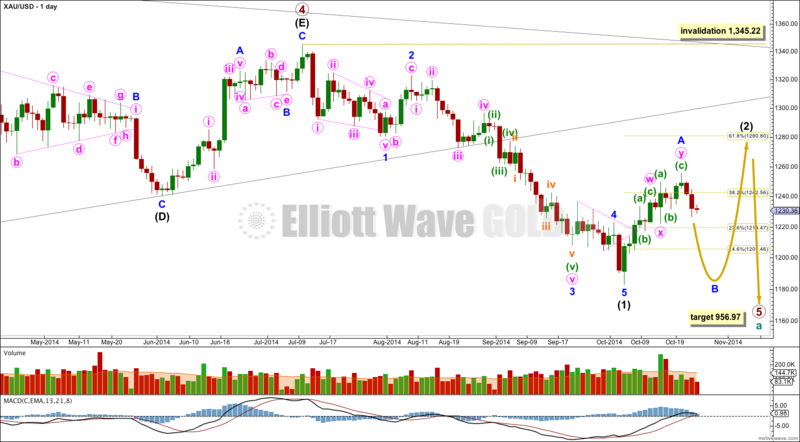 A red candlestick for Friday’s session fits the Elliott wave count, but more downwards movement was expected. Summary: Intermediate wave (2) is unfolding as a big flat correction. I expect more downwards movement for a few days to at least 1,190.04. It is possible we may see a new low below 1,183.06. 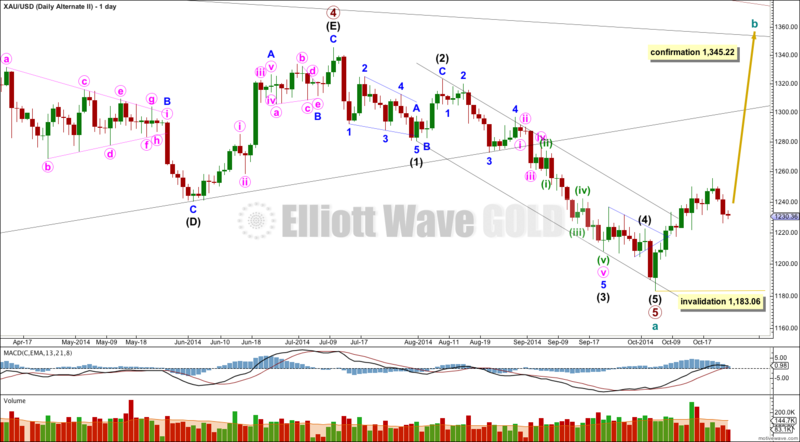 On the weekly chart extend the triangle trend lines of primary wave 4 outwards. The point in time at which they cross over may be the point in time at which primary wave 5 ends. This does not always work, but it works often enough to look out for. It is a rough guideline only and not definitive. A trend line placed from the end of primary wave 4 to the target of primary wave 5 at this point in time shows primary wave 5 would take a total 26 weeks to reach that point, and that is what I will expect. Primary wave 5 has just completed its 15th week. At 956.97 primary wave 5 would reach equality in length with primary wave 1. Primary wave 3 is $12.54 short of 1.618 the length of primary wave 1, and equality between primary waves 5 and 1 would give a perfect Elliott relationship for this downwards movement. However, when triangles take their time and move close to the apex of the triangle, as primary wave 4 has, the movement following the triangle is often shorter and weaker than expected, and this is my main reason for presenting the alternate wave count to you. If the target at 956.97 is wrong it may be too low. In the first instance I expect it is extremely likely that primary wave 5 will move at least below the end of primary wave 3 at 1,180.40 to avoid a truncation. When intermediate waves (1) through to (4) within primary wave 5 are complete I will recalculate the target at intermediate degree because this would have a higher accuracy, and the target may move higher. I cannot do that yet; I can only calculate it at primary degree. Movement comfortably below 1,180.84 would provide further confidence in this main wave count as at that stage an alternate idea which sees primary wave 4 as continuing as a barrier triangle would be invalidated. I am not publishing this alternate idea as a chart because it has an extremely low probability. Intermediate wave (2) may end close to a Fibonacci ratio of intermediate wave (1). Only because second waves are more commonly deep than shallow is the 0.618 ratio at 1,280.80 slightly favoured. But it does not have to be this deep. When we know where minor wave B has ended then I can calculate a target for intermediate wave (2) to end. Intermediate wave (1) lasted 62 days. For the wave count to have the right look intermediate wave (2) should continue for longer than it has so far. Intermediate wave (2) is unfolding as a flat correction, subdividing 3-3-5. Within it minor wave B downwards must subdivide as a three, and may make a new low below the start of minor wave A at 1,183.06 as in an expanded flat. Minor wave A lasted 11 days, and I would expect minor wave B to be at least 11 days and maybe longer as B waves tend to be more time consuming structures. Because upwards movement for minor wave A has a perfect fit as a double zigzag we can rule out the possibility that intermediate wave (2) is unfolding as a combination. Within a combination the maximum number of corrective structures is three, and so each correction within a combination labeled W, Y (and Z) may only subdivide themselves as simple A-B-C corrections (or A-B-C-D-E triangles), they may not subdivide as W-X-Y. Because minor wave A upwards is a corrective three wave structure this indicates intermediate wave (2) is a flat correction. Within a flat minor wave B must reach a minimum 90% length of minor wave A at 1,190.04. The depth of minor wave B will indicate what type of flat is unfolding. If it ends between 90% to 104% of minor wave A then a regular flat may be unfolding, which would expect minor wave C to be about the same length of minor wave A. If it is 105% or longer this would indicate an expanded flat is unfolding and minor wave C would be likely to be 1.618 or 2.618 the length of minor wave A. The most common length for minor wave B within a flat is between 100% to 138% the length of minor wave A, between 1,183.22 and 1,155.79. So far within minor wave B downwards minute wave a is most likely incomplete. I have adjusted the wave count within downwards movement to have better proportions. There is no Fibonacci ratio between minuette waves (iii) and (i) and so I would expect to see a Fibonacci ratio between minuette wave (v) and either of (i) or (iii). At 1,219 minuette wave (v) would reach equality in length with minuette wave (i). If minute wave a subdivides as a five wave structure then minor wave B would be unfolding as a zigzag. Within a zigzag minute wave b may not move beyond the start of minute wave a above 1,255.40. Within minute wave a if minuette wave (iv) continues further it may not move into minuette wave (i) price territory above 1,240.55. It is extremely unlikely that minuete wave (iv) would move higher, as it is already much longer in duration than minuette wave (ii). Use Elliott’s second technique to draw a channel about minute wave a. Expect the fifth wave to most likely end midway within the channel, or less likely at the lower edge. It is possible that minute wave a is a complete three wave structure because 1-2-3 and A-B-C subdivide in exactly the same way. I am not charting this idea for you though because I consider it has too low a probability. 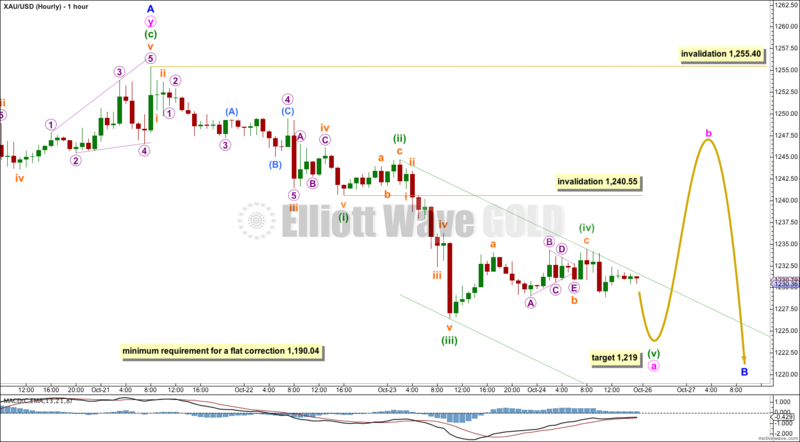 Minute wave a would be far to short and brief for a flat correction to reach down to 1,190.04 or below. If the first invalidation point at 1,240.55 is breached before a fifth wave down is complete then I would consider this idea. At that stage if minute wave a is a three wave structure minute wave b should be a very deep correction, and may make a new high above the start of minute wave a at 1,255.40. So a breach of 1,240.55 on Monday would indicate a new high is possible. It is possible that the double zigzag is a completion of intermediate wave (2), but this idea has a very low probability. This would see intermediate wave (2) only 45% of intermediate wave (1), but more importantly it would have lasted only 11 days in comparison to the 62 days for intermediate wave (1). This is too brief to give the wave count the “right look” on the daily chart. This alternate also expects downwards movement. If price moves below 1,231.78 then only careful attention to structure (is it a three or a five?) of the next wave down would tell if this alternate is correct or if intermediate wave (2) is continuing as a flat correction. At 993 intermediate wave (3) would reach 1.618 the length of intermediate wave (1). By simply moving the degree of labeling within primary wave 5 downwards all up one degree it is possible that primary wave 5 and so cycle wave a are over. This wave count is reduced in probability by a small truncation. Primary wave 5 would be truncated by $2.66. The truncation is small though, so this wave count must be considered. Movements out of triangles are often more brief and weak than expected, sometimes they are surprisingly brief. There is a nice example of what I mean by this here on the daily chart: after the triangle of intermediate wave (4) we saw a surprisingly quick short intermediate wave (5) down afterwards. If price breaks out of the upper edge of the parallel channel about cycle wave a (look to the weekly chart for this channel) this would be first indication that this wave count is correct. This trend channel confirmation would come before price confirmation above 1,345.22. The first movement upwards for cycle wave b should be a five wave structure. 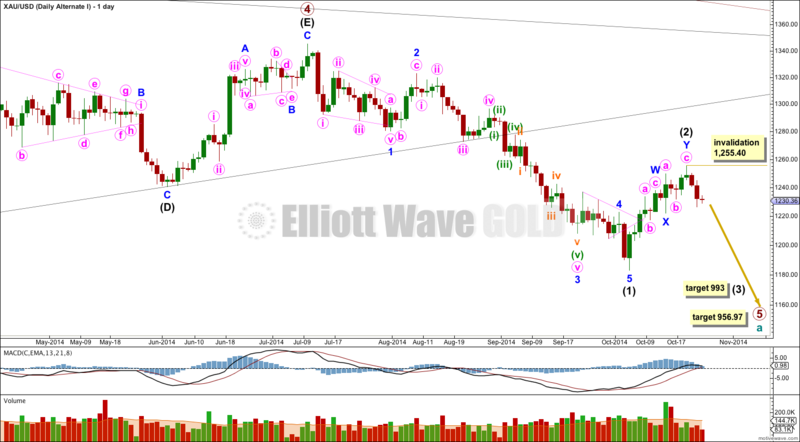 Within it no second wave correction may move beyond the start of its first wave below 1,183.06. Movement above 1,345.22 would invalidate the main wave count and confirm this alternate. At this stage upwards movement is not looking like an unfolding impulse because it is too choppy and overlapping, and so this alternate wave count is further reduced in probability. This analysis is published about 05:55 p.m. EST.